Sometime last night this blog passed the 50,000 hits mark - many thanks to you all for following us! 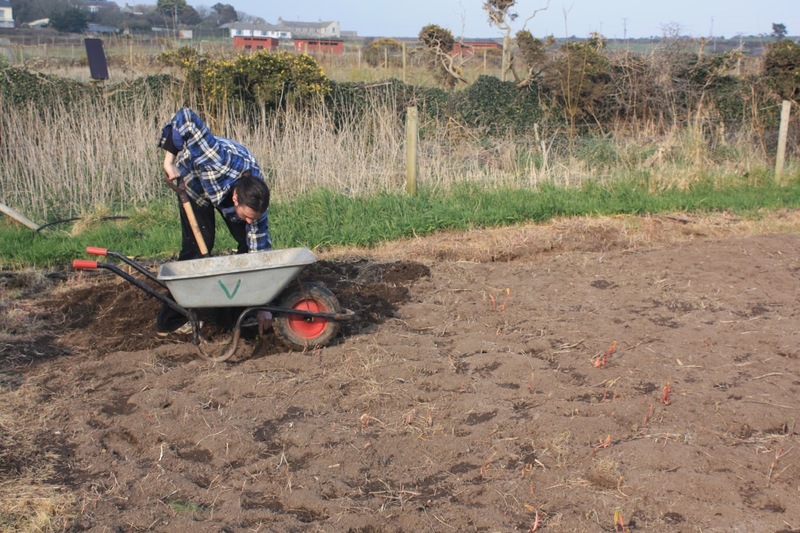 And also thanks to Felix, who left us last night after 2 weeks volunteering on the farm - and again special thanks for his potato planting exertions. Felix digging roots out of the outdoor sheltered bed before we rotavated it. 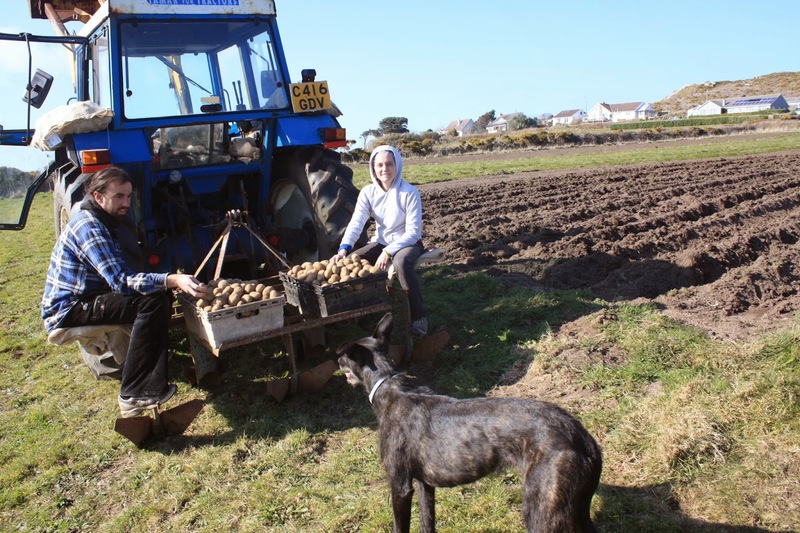 Many thanks to Neus, from Barcelona, who left us for her next wwoofing assignment near Bath this morning, after 3 weeks helping on the farm - particular thanks for spending one long Saturday on the back of the tractor planting potatoes (with Felix). Neus digging dock roots out of the sheltered bed. New veg box collection hubs. We are delighted to welcome two new veg box hubs to our network, making it easier for customers to collect their veg boxes in both St Just and Penzance, and saving the £1 delivery charge. St Just Age Concern is open for collecting your veg box on Saturday mornings 09:30 till 13:30. Poppies Community Cafe, at the bottom of Belgravia Street in Penzance (just around the corner from Archie Browns), is open for collecting your veg box on Saturday mornings 10:00 till 14:00. If any of our existing customers would like to collect their box from these hubs, or if new customers would like to start doing so, then please let us know on 01736 788454, or email vegbox.bcf@bcents.org.uk. 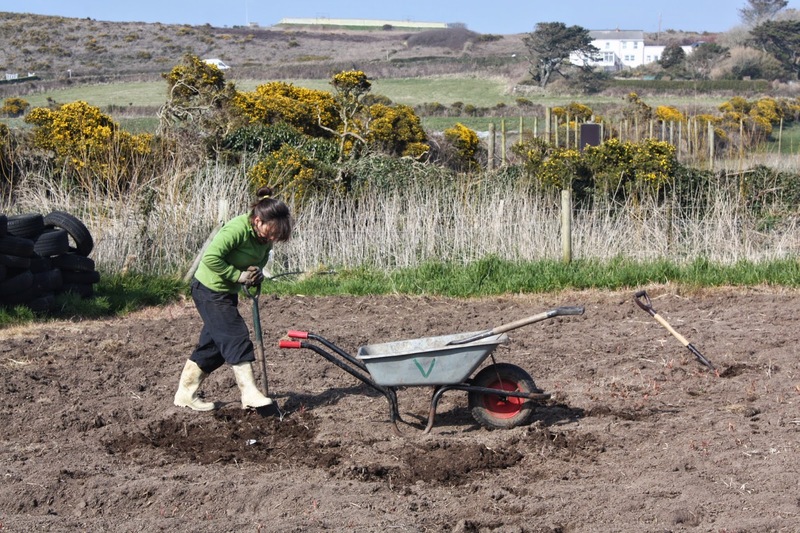 Our other hubs are the North Inn in Pendeen, the Apple Tree Cafe near Sennen, and the farm itself. 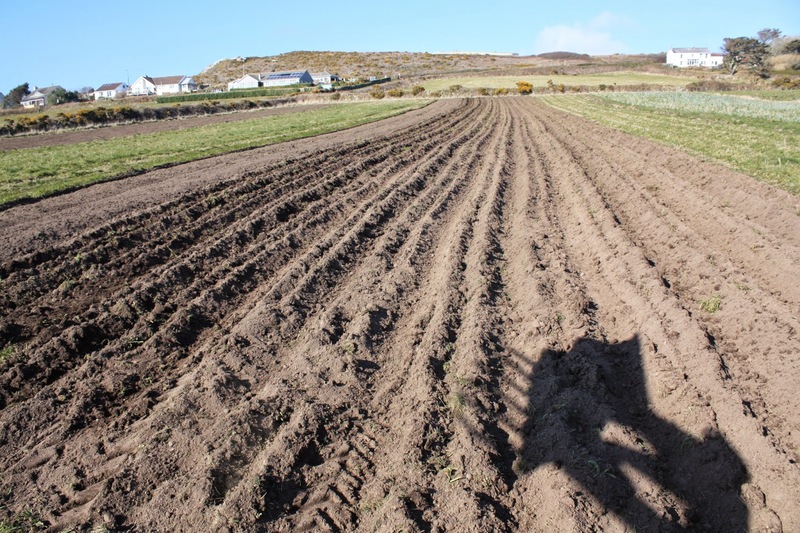 Yesterday we got all this season's potatoes planted - hooray! This entailed a lot of ground preparation - ploughing and rotavating 1.5 acres - then one long day getting 60 sacks of seed potatoes into the ground. This year we have gone for 4 varieties, 15 sacks of each: Maris Peer as our tried and tested early, Picasso as a pink-eyed early maincrop, Valor as a maincrop, and Sarpo Mira as a blight-tolerant maincrop variety that we are trying for the first time. Pete ploughing the third and final potato patch on Wednesday. Neus and Felix on the planter, ready to plant Maris Peer. Felix and Alice on the planter, loaded with Valor. The second potato patch almost planted. Special thanks go to Pete for preparing all the ground on his own (with tractor and Tigerlily! ), and to Neus and Felix for sitting on the planter till 6:30 pm yesterday to get them all planted in one day - a great effort all round. 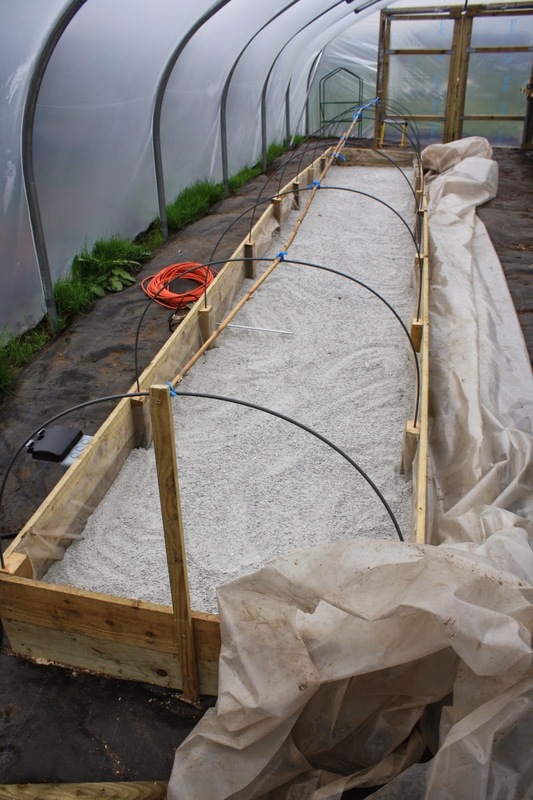 Building a hot propagation bed, phase two. 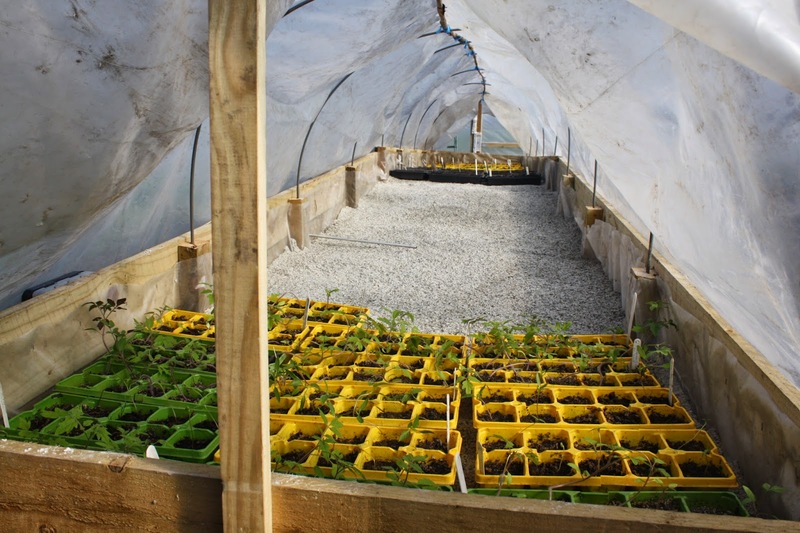 Our hot bed is now fully up and running in the Propagation Station, maintaining a temperature of 25-30 degrees Celsius day and night, and our tomatoes, cucumbers, chillies, courgettes, peppers and aubergines are already germinating. 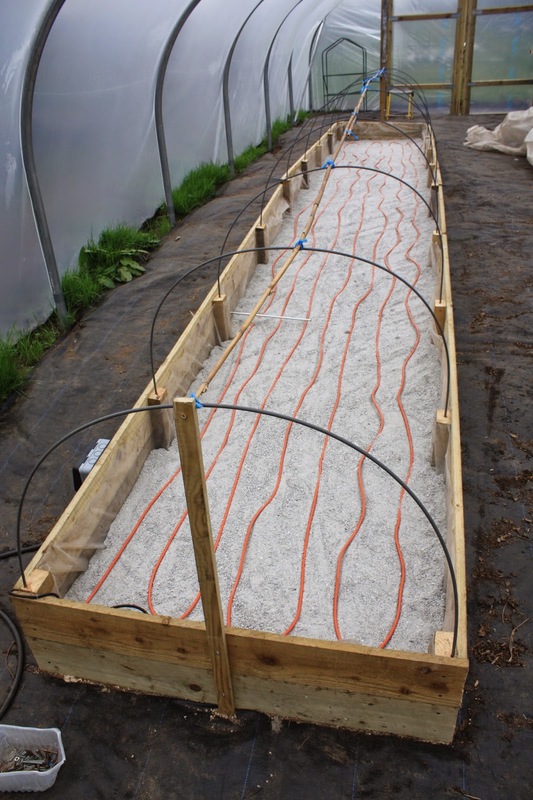 About to lay soil-warming cable onto a bed of coarse sand, with the thermostat already fitted. 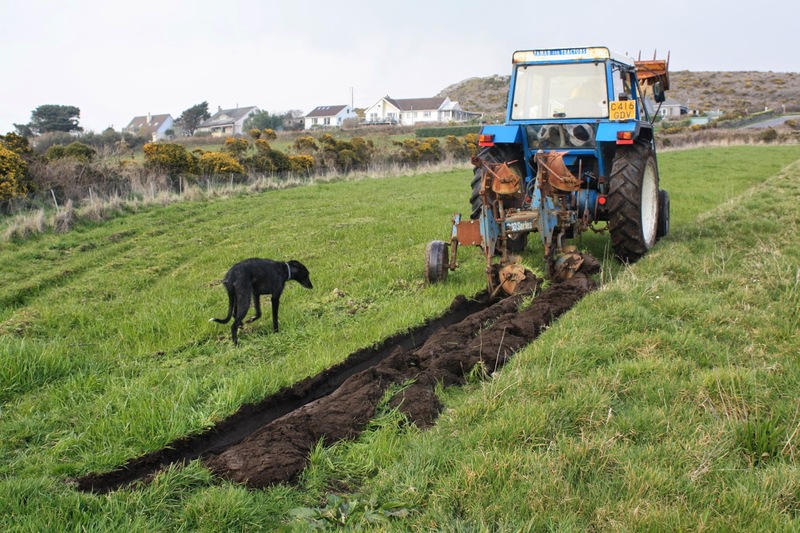 Soil warming cable laid and ready to cover. 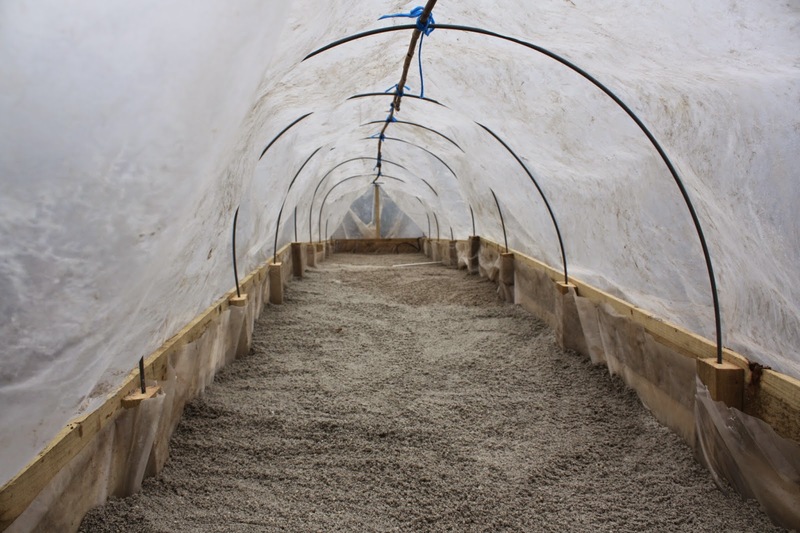 Covering the soil warming cable with an inch of coarse sand. 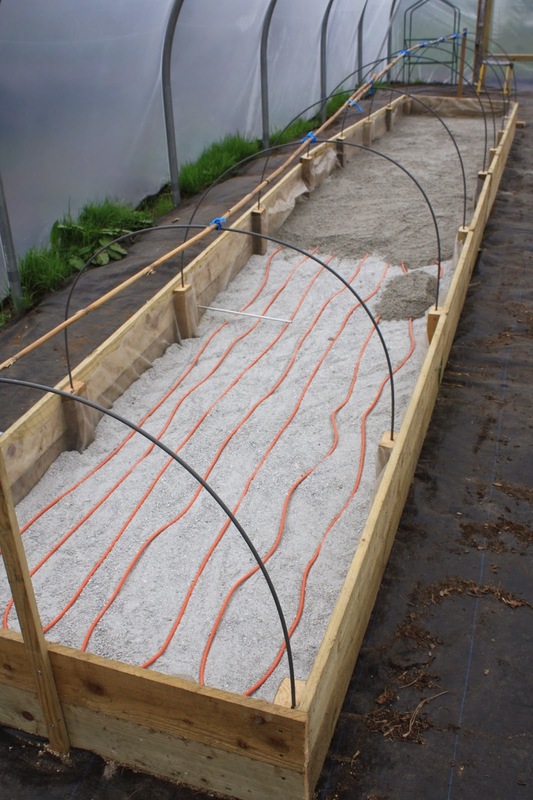 The cable covered, and the lid of the hot bed over (made using a section of plastic from our destroyed polytunnel). Tomato and chilli seedlings coming along, having already been germinated above the kitchen stove. 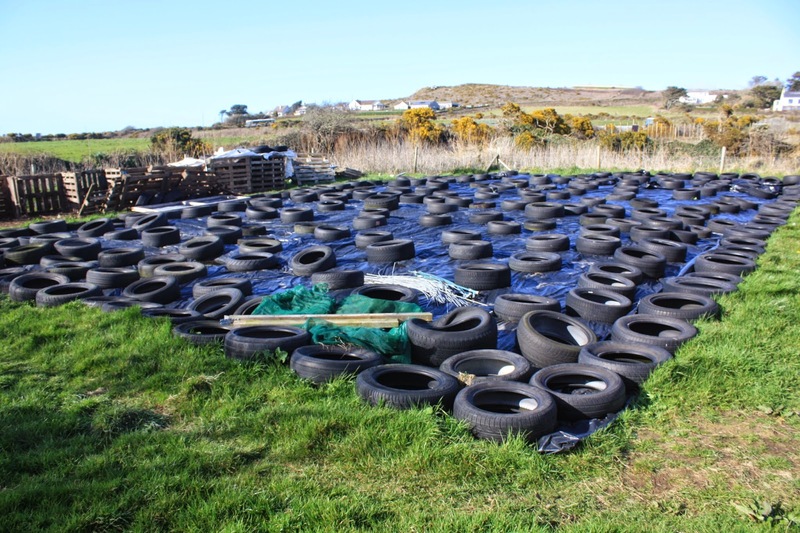 The place where our "Baby" polytunnel was destroyed by storms last February (see previous blog entries) has been covered with black plastic over winter to kill the weeds. 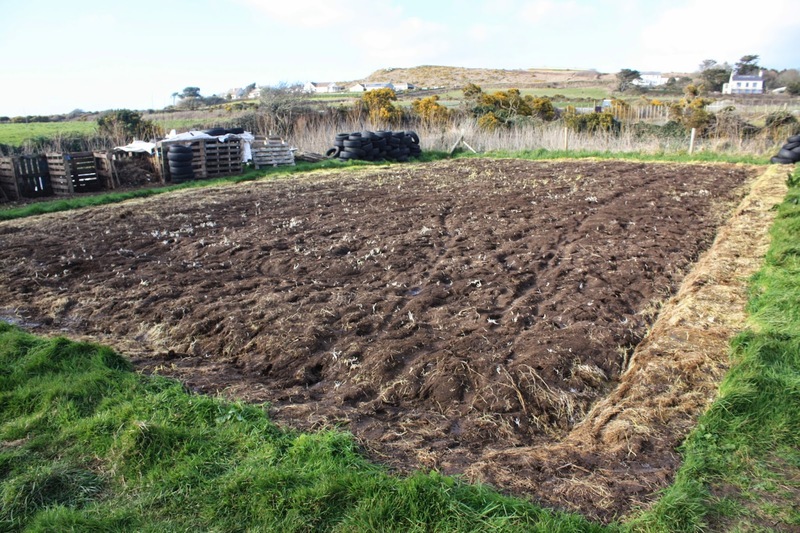 On Friday we removed the plastic mulch, and the patch is now drying out in the sun, after which we will tractor-rotovate it, re-lay the irrigation pipes, build a wind-mesh around the outside, and use it as an outdoor salad bed, sowing one third at a time on a monthly rotation. We would like to thank Davide, from Genoa, for his ten days helping on the farm as a WWOOF volunteer, and wish him all the best back home in Italy. The week just gone was even more hectic than normal, so much so that we hardly had time to take photos or write blog entries, or even to muck out the chickens - delaying that weekly task to the weekend. We had three days of tree-planting with The Conservation Volunteers, a team of helpers from Nancealverne School for one day, two markets to prepare for, our tractor machinery to ready for the season (in particular the plough, rotovator and potato planter), Friday's usual great salad pick (13.8kg this week, a new record), a board meeting, plus several visits including the first by Andrew George MP for this constituency. Starting the latest phase of tree planting with The Conservation Volunteers on Tuesday morning. Tree planting with Nancealverne School students on Friday morning. 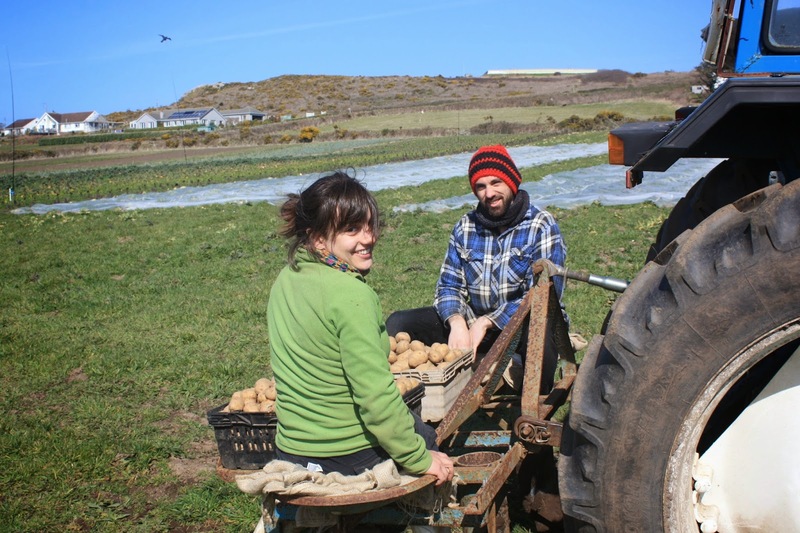 Many thanks to Tommy and Jessie, from France, for their endeavours during one month of volunteering on the community farm, and we hope the weather is good for you on your new farm in Wales. 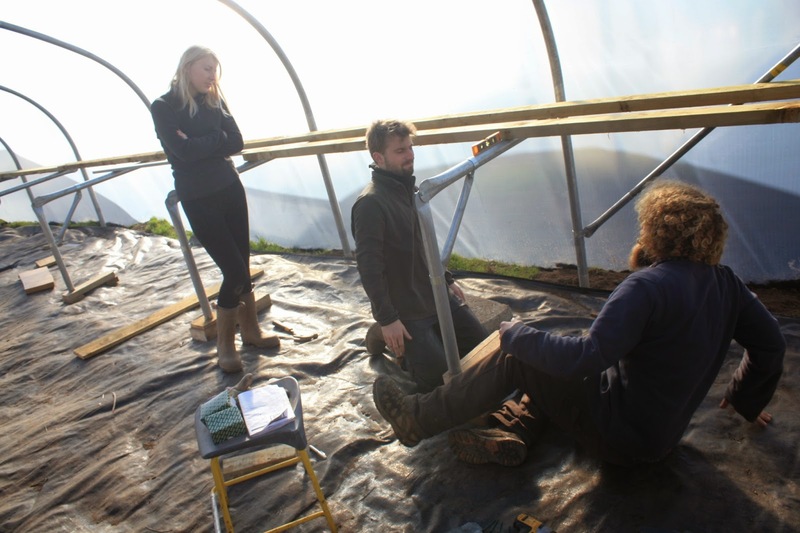 Jessie and Tommy helping Pete to level the propagation shelving.